Heavily used in Thai recipes, lime leaves are super fresh, intensely aromatic, and citrusy. Their fragrance is beautiful and their taste is mind-blowing. If you have not had the pleasure of tasting lime leaves before now, you need to run to your supermarket stat. You’ll be amazed how much flavor these little leaves contribute. Lime yours! These leaves add an elegant flavor to Asian cuisine including stir-fry, curry, salad, and fish. 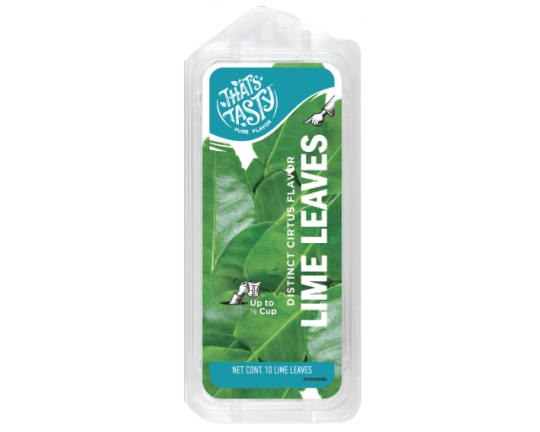 Store lime leaves in air-tight freezer safe container and keep in freezer for up to one year. They retain their flavor and can be pulled out to use in cooking anytime. If you just have a few lime leaves leftover from a recipe, add them to cocktails for a fresh citrus note.